Yesterday, we shared a Q&A with Holly Bourne, author of Am I Normal Yet?, one of this year’s World Book Night books. As supporters of World Book Night, I’m really pleased to be able to share another fab Q&A with you this today, just before World Book Night itself, from Leigh Bardugo, whose book Shadow and Bone I absolutely loved and reviewed. This time, Leigh shares her reading habits, advice on recommendations for reluctant readers, and Shakespearean favourites. I hope those lucky people receiving Shadow and Bone this evening enjoy it as much as I did…! The Shadow Fold, a swathe of impenetrable darkness, crawling with monsters that feast on human flesh, is slowly destroying the once-great nation of Ravka. Alina, a pale, lonely orphan, discovers a unique power that thrusts her into the lavish world of the kingdom’s magical elite – the Grisha. Could she be the key to unravelling the dark fabric of the Shadow Fold and setting Ravka free? The Darkling, a creature of seductive charm and terrifying power, leader of the Grisha. If Alina is to fulfil her destiny, she must discover how to unlock her gift and face up to her dangerous attraction to him. The Shadow Hero by Gene Yang. This graphic novel tells the story of the first Asian-American superhero. It’s hilarious, thrilling, and poignant too. Plus, if your reader gets hooked, Gene has a fantastic body of work to sustain that interest. Shadowshaper by Daniel José Older invites readers into a magical New York and takes on themes of creativity, appropriation, and power while never scrimping on adventure. This is a great one for young artists who may not quite believe in their gifts. For younger readers, The Wig in the Window by Kristen Kittscher is a witty, diverse middle grade mystery with an even more charming sequel. I’m really an inside person, but I like to sit in the shade by the lemon tree in our back garden with a new book. It’s also a relaxing place to revise my own work, though I’m pretty sure my neighbour is sick of hearing me read the same chapters aloud over and over. The Huntington is probably my favorite place in Los Angeles for an afternoon of reading and exploring. The gardens are massive enough to get lost in, and the drive there clears my head. Sonnet 29 or Twelfth Night. I love a bit of Richard III. Fantastic choices from Leigh – Howl’s Moving Castle is just magical. 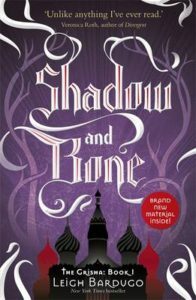 Have you found any new recommendations, or are you looking forward to trying Shadow and Bone? I’d love to hear from you.